This discography includes all worldwide releases on VHS, Betamax, Laserdisc and Video-CD, and one CD-Rom release. There is a separate discography for DVD releases, however, this page does include details of any standard reissues on DVD. Two additional releases of note are 'Absolute Greatest', which gave access to online streams of live videos, and the 2011 iTunes LP reissues of Queen's 15 studio albums, all of which included bonus videos. 2 November 1981. Released in the UK (VHS, Betamax and CED), Japan (VHS and Laserdisc), USA (Laserdisc only) and Australia (VHS only), and also released as an album. The video was also released in South Africa on VHS in 1991, and was essentially re-released as a DVD in 2002, retitled as 'Greatest Video Hits I', with bonus tracks. It was also included in the 1991 'Box Of Flix' and the 1994/7 'Greatest Flix I & II' releases. The USA release omits the 'Bicycle Race' video. See also the 1991 release 'Greatest Flix II' and the 1999 release 'Greatest Flix III'. 3 October 1983. Released in Japan on VHS only. It was released on laserdisc in 1986, reissued on VHS in 1992, and again on both VHS and Laserdisc in 1999. Half of the tracks on this video were later released as part of the 'Queen On Fire - Live At The Bowl' DVD. 1984. Released in the USA only. This features the same tracks as the '15 Of The Best' album, arranged into chronological order. 10 September 1984. Released in the UK, USA, Japan, and possibly other countries. There are two different versions of this video available, with running times of 60 and 90 minutes. The full 90 minute version was released in the UK (VHS and Betamax), Japan (VHS and Laserdisc) and USA (VHS, Laserdisc and later DVD). The edited 60 minute version was released in the UK (VHS only) and USA (VHS and Laserdisc). 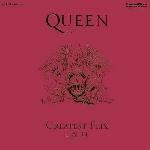 This video was later re-released as a CD and DVD, retitled as 'Queen Rock Montreal'. 13 May 1985. Released in the UK (VHS and Betamax), Japan (VHS and Laserdisc), USA (Laserdisc only) and Brazil (VHS only). The video was later reissued on DVD in 2013, exclusive to a North American 6 DVD Box Set. 08. Is This The World We Created? 20 October 1986. Released in the UK on VHS only. 16 February 1987. Released in the UK (VHS only), Japan (VHS and Laserdisc), Germany (Laserdisc only) and Russia (VHS only). The video was later remastered and reissued as 'Hungarian Rhapsody' on DVD and Blu-ray. 30 March 1987. Released in the UK on VHS only. 30 November 1987. Each video was released in the UK (VHS only), Japan (VHS and Laserdisc) and Australia (VHS only). The videos were also released together in a boxed set/slipcase in the UK (VHS only), Japan (VHS and Laserdisc) and USA (Laserdisc only). Finally, an hour long compilation featuring elements from all three videos was released on VHS in South Africa in 1989. Collectively, these three volumes form a three-hour long documentary covering Queen's formation from Smile upto the 'A Kind Of Magic' album and the Magic Tour. 21 August 1989. Released in the UK (VHS only), Japan (VHS and Laserdisc) and Brazil (VHS only). 27 November 1989. Released in the UK on VHS only. 3 December 1990. Released in the UK (VHS only), USA (VHS only) and Japan (VHS and Laserdisc). This video was later expanded and re-released as the 1992 album 'Live At Wembley 1986', and retitled as 'Live At Wembley Stadium' for a 2003 reissue CD, 2003 DVD, and 2011 DVD. 28 October 1991. Released in the UK (VHS only), Japan (VHS and Laserdisc), Australia (VHS only), Brazil (VHS only) and South Africa (VHS only), and also released as an album. This video was essentially re-released as a DVD in 2003, retitled as 'Greatest Video Hits II', with bonus tracks, but omitting the four 'Innuendo' tracks. It was also included in the 1991 'Box Of Flix' and the 1994/7 'Greatest Flix I & II' releases. See also the 1981 release 'Greatest Flix' and the 1999 release 'Greatest Flix III'. 28 October 1991. Released in the UK and Japan on VHS only. This is a double VHS set containing the 'Greatest Flix' and 'Greatest Flix II' videos, with four bonus videos. It was reissued in 1997 on laserdisc, retitled as 'Greatest Flix I & II'. May 1992. Released in the UK on VHS only, as part of the 'Box Of Tricks' boxed set. This video was later remastered and expanded to include the full performance, and released in 2014 as the 'Live At The Rainbow '74' album, DVD and Blu-ray. 13 October 1992. Released in the USA on VHS only, and also released as an album. 1992. Released in Japan on VHS and Laserdisc only. It was also reissued in 1999, and again on DVD in 2004. 13. Is This The World We Created? 23 November 1992. Released in the UK (VHS only), Japan (VHS and two separate Laserdiscs), USA (Laserdisc only) and Brazil (two separate VHS releases). The video was later re-released in 2002 as a double DVD, and in 2013 as a triple DVD or Blu-ray, although the 2002 release lost most of the first video. 1994. Released as a double Video-CD, and later in 1997 as a double laserdisc and double DVD. The Video-CD features the 'Greatest Flix' and 'Greatest Flix II' videos, with a slightly rearranged tracklisting (moving 'A Kind Of Magic' and 'Under Pressure' to disc 1), and several tracks are slightly edited. The DVD features both standard videos, while the laserdisc contains the same tracks, but is essentially a reissue of the 'Box Of Flix', adding four bonus tracks. 6 November 1995. Released in the UK (VHS and Video-CD), USA (VHS and Laserdisc) and Japan (VHS and Laserdisc). 11 November 1996. Released in the UK (VHS only), USA (VHS only), Japan (Laserdisc only) and Brazil (VHS only). Reissued on DVD on 24 March 2003, featuring additional material 'The Making Of We Will Rock You'. 18 November 1998. Released in Japan only, on VHS and Laserdisc, and also released as an album. Re-released on DVD in Japan on 14 June 2004 with four bonus tracks, retitled as 'Greatest Karaoke Hits', and also released as an album. 9 November 1998. Released in the UK (VHS only) and Japan (VHS and Laserdisc). This is a video equivalent of the album which was previously released in 1997. 6 December 1999. Released in the UK (VHS only), USA (probably VHS only), Japan (Laserdisc and maybe VHS), Malaysia (Video-CD), Taiwan (Video-CD) and probably other countries, and also released as an album. See also the 1981 release 'Greatest Flix' and the 1991 release 'Greatest Flix II'. 2002. Released in the Netherlands only, as a promotion through the Heineken website.